Q: MovieMaker: The video produced by the MovieMaker is jittery! Most of the time this can be resolved by Formatting the SD card using the Wolverine MovieMaker. Use high speed SD cards for optimum results. Q: MovieMaker: I receive the message "cluster size error"? 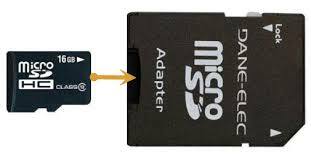 Cluster size error means that you are either using a very old SD card (1GB or less), you are using larger than 32GB card or you did not format the card using the Wolverine unit. Most likely you did not place the film under all the white tabs. Please, check the image below for proper placement of the film into the channel. Q: MovieMaker - My film wont go through the MovieMaker? Some old film, split 16mm or Super8 came at a little wider than 8mm or expanded at some sections due to age and for that reason the unit will have a hard time pulling the film from its sprocket holes. 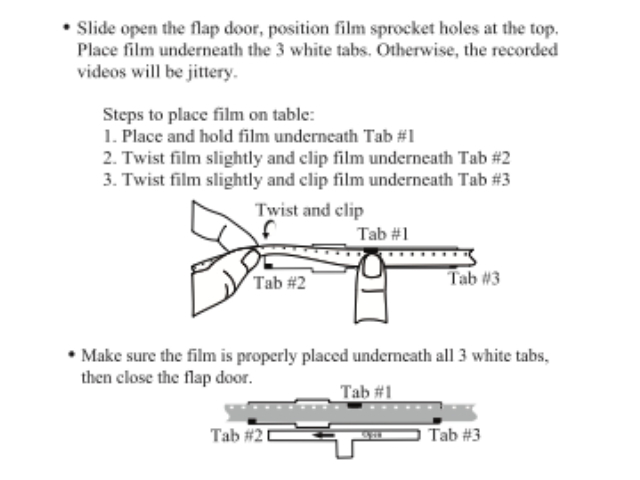 A work around this issue would be to get a small piece of paper 1x1.5 inch, fold it four times and wedge it between edge of the flip door and the track in the location shown in the pictures file below to keep the door from closing all the way. A film showing the digitizing of the same 16 seconds of a super 8 home movie using 5 different settings: 1) Default; 2) high sharpness, default exposure; 3) low sharpness, default exposure; 4) default sharpness, +.5 exposure; 5) default sharpness, - .5 exposure. Then a fast recap comparison of default vs low sharpness. Q: MovieMaker - The whole video or some portions of my video are Jittery? This mighty happen if some of the film's sprocket holes are slightly damaged as shown in below pictures and video. To tell if that is the case zoom out using the Frame Adjust option unit you see the sprocket holes. Record few seconds and check if the sprocket holes looks worn out at the upper section as shown in the video. A work around this issue is to wind the film to the empty reel and scan the film backwards. This way the unit will scan by grabbing on the good side of the sprocket holes then, using a video editing software you can reverse the playback and save the file playing forward. Q: MovieMaker: How do I adjust the Frames? Q: MovieMaker - If the Wolverine MovieMaker start acting erratic. If the Wolverine MovieMaker start acting erratic where it may start working right after you plug the power or no response from buttons then the sensor under the pin that pulls the film is clogged with dirt that came out of the film. Please, use a compressed air can and blow air left and right of the pin as shown in below video. Please, clean the film using a lint free cloth before scanning to minimize this issue. Q: MovieMaker - My video is playing at 30 fps although my film was recorded at between 16-24fps. The unit produce MP4 file that runs at 30fps because today there is no chip that can produce a lesser FPS. However, all computer players have the option to reduce the playback speed. For 8mm reduce the playback speed to 60% and for Super 8 to 80%. Furthermore, you can use free video editing software like Shotcut from www.shutcut.org or any other video editing software to join files, slow playback, add text, voice over etc. If you are using a Mac, you can use the pre-installed iMovie App. Q: Wolverine F2D - I bought the Wolverine F2D from HSN. However, it is not working, the unit is freezing and buttons are not working. Q: F2D TITAN - How to Adjust Image Cropping? Press and hold the “C” button and while holding the “C” press the Power button. At the Center ADJ screen press the right arrow button twice to highlight the Ratio (changes to yellow) and press the OK button. press the left arrow button to decrease the value to zoom out or the right arrow button to increase the value and zoom in. Press OK to finalize and press the Power button to turn off the unit. Q: F2D TITAN / MIGHTY: I have European thick slides that measure about 3mm in thickness. How can I scan these slides using the Slide Adapter? Q: How Do I adjust Image or video date? The Wolverine units don't have a clock and the date is an arbitrary date. You change the date when you import the images/videos to the computer.